I stumbled across these images of Flair Home on Layers of Meaning, a fabulous blog whose author was sweet enough to name me her favorite blog of the week. She also happens to be building a beautiful house near Atlanta. Maybe she knows, NeNe! I kid, I kid. Anyhow, I stopped dead in my tracks as soon as I saw these incredible images of Flair Home. It's just too good! Bold palette...check! An eclectic mix of unique furnishings and decorative accessories...check! A fabulous combination of European and American design...check! How much do you love the bold black walls? 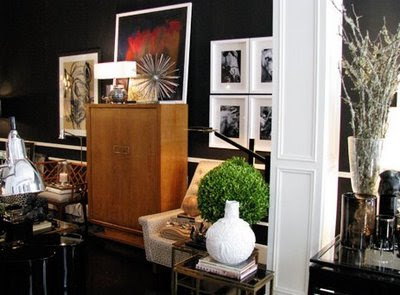 The white mouldings, furniture, and artwork all look so great against it. Here is a little more information from the Flair Home website for you to read while I keep swooning. "Founded in 1998 in Florence, Italy, FLAIR is the realization of the highly personalized style of Alessandra Tabacchi and Franco Mariotti. 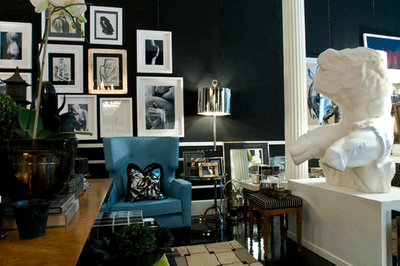 In contrast to the prevailing decorative culture of traditional antiques in Florence, the furnishings at FLAIR are reflections of various eras, both modern and timeless.The iconic black and white mood provides a setting for the juxtaposition of ebonized Napoleon III armoires with chalky white ‘40’s plaster sculptures, opalescent Venetian glass with ‘70’s chrome consoles. Precious materials such as parchment and stingray mingle with plexiglass and marquetry finished rosewood. English tweed and pinstripe flannel upholstery contrast with pillows created of vintage Italian 50’s printed couture silks. FLAIR now has three stores in Italy – Florence, Milan and Capri. Each store represents the FLAIR style appropriate to the atmosphere. The grand windows of FLAIR Milan provide a showcase for ebonized wood and gilded consoles, neoclassic sculptures and Futurist paintings. The creative energy of Milan is captured in the large selection of vintage artworks and ‘70’s Italian Modern furniture. FLAIR Capri is located just steps away from the famous “Piazzetta” and reflects the worldly, yet relaxed, beach style of the island. Cerused oak tables, bergere chairs upholstered in raffia and raw silk mingle with sinuous ceramics, chrome lamps and black and white photographs of Capri Island. 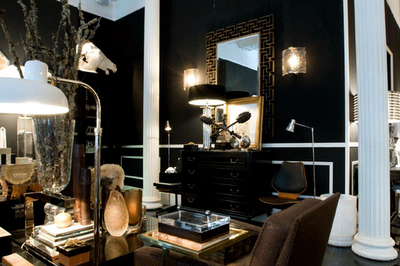 In April 2008, FLAIR New York opened in Soho, the natural location for the “FLAIR style.” In a space evocative of a traditional Soho loft, the black and white atmosphere is softened by the warm, rich tones of natural woods and the shine of polished textiles. The transparence of plexiglass contrasts with polished brass, black lacquer with Moroccan rugs, French 19th century with Italian ‘70’s FLAIR New York is a reflection of the artistic history of Soho mixed with the polish of unique vintage European furnishings." I'm actually 2 hours (south east) from Atlanta in Augusta. Thanks for stopping by.. I love your blog! You have to check out the photography by Christopher Draghi which is shown at Flair - it is absolutely stunning! Thanks for the link, avidHome! His work is amazing.